I'm a small business owner who dabbles in a little bit of everything. 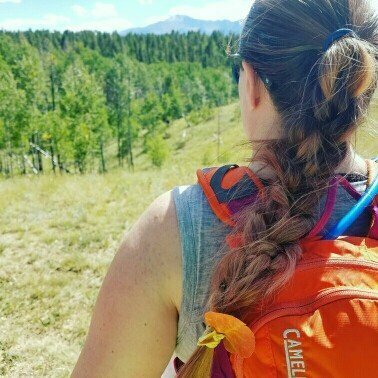 I'm a lover of food, beer, dogs, clothing, accessories, shoes, nail polish, makeup, skincare, fragrance, health, decor, creativity, outdoors and everything in-between! For what it is, it works very well! I can't say that I've ever really been interested in root touch up. I'm fine with my root grow out and the grey hairs that I have. So I don't really use this to cover all of that, cause honestly I'd need a lot of it and it doesn't bother me. Instead I use this more to give an even look at my hairline. I have some spots on my hair line that sit back further than the rest of my hairline and this allows me to make it look more full. You don't need a lot of it and it blends well. The brush seemed a little small at first, but I ended up liking it a lot because it allows me to work in smaller areas without adding too much product. It also blends nicely. The powder is easy to remove if application gets a little crazy or if it ends up on skin you don't want it on. I does look fairly natural as long as you aren't going overboard with the application. Though after a half day of wear it does seem to settle into my skin, making it look dirty, but touchups and reapplication is easy. I can't say that I will use it every day, but it's nice to have as an option for when I want my hairline to look nicer, especially when I'm wearing a pony tail. I also think I'll have this product for quite some time, because there is a nice amount of product and a little really does go a long way. I've barely made a dent in mine. Y'all, I don't even know where to start with this. I guess I should say that bareMinerals was one of my first "adult" makeup purchases. I remember buying their powder foundation at ULTA and being in love with it. In fact I still use that foundation 15+ years later. I have a multitude of other products from them as well. Ranging from loose eyeshadows, pressed shadows, lip colors and blushes. It's easy to say that I love the brand. I trust it, I know I can usually find my shade in their lineup. 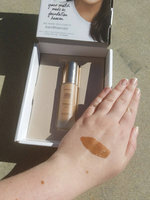 So when I was asked by Influenster to try out bare Minerals new Made-2-Fit foundation, I was excited. Foundation matching in the comfort of my home? Yes Please! I downloaded the app and went through the song and dance of being color matched. The app was easy to use, with clear instructions. Based on the colored blob it showed me, on my phone screen, it seemed like it would be close match. As much as you can tell based on a screen picture. I put it in my cart and waited for my special code so I could get it for free. All seemed well till I got my code. When I went back into the app it crashed. Continually. When it didn't crash all I would see is a white screen. I deleted the app and re-downloaded it close to 20 times. When I would reopen it, directly after downloading it again, it would show me the app properly, but when I'd go to my cart, it would once again crash. Leaving me with errors every time I reopened it, unless I did the delete/download dance. I went to my husband with the issue, as he has some background in coding. He's assumption was there was an issue with the app reading what was in my cart. That maybe the "hold time" on the item expired, but didn't get dropped from the cart properly, so it was throwing errors. Awesome. So I had to create a whole new account to work around this issue. I then redid the color matching process in natural light. The coloring seemed off from the color blob it showed when I was done. So then I went to different lighting in my house and had the same issue. I finally found an area of natural but defused light and the match seemed okay. I sent off my order and waited. Today my box showed up. I eagerly opened to be greeted by a bottle that looked a bit too dark. 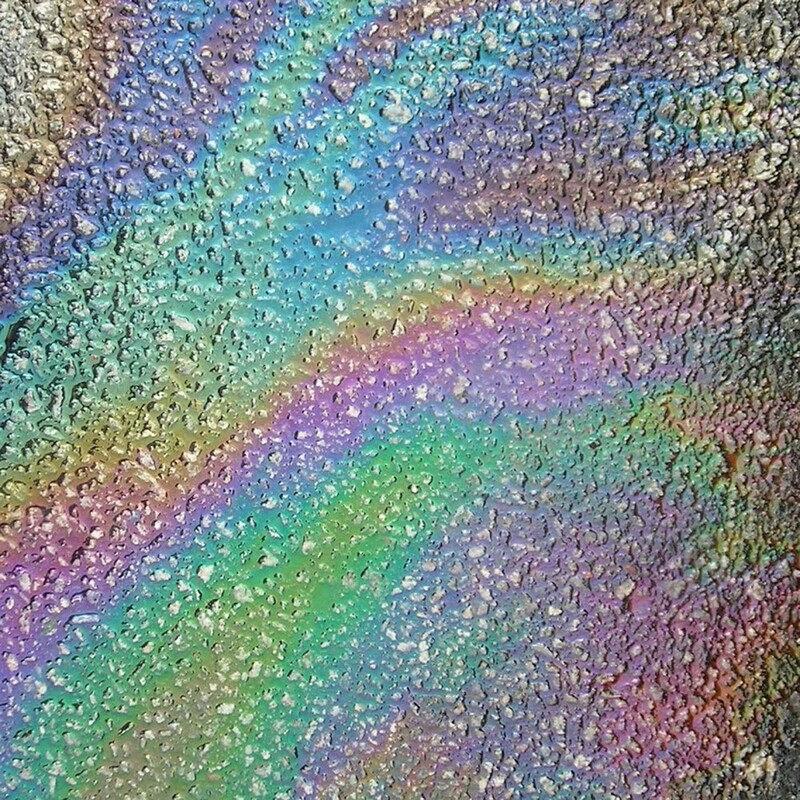 But we all know that the colors inside the bottles lie. So I opened it up and just about choked on my laughter as I looked at a color that was nowhere close to correct. And I don't mean a color that was maybe a bit too warm or too orange. I mean I color that isn't even remotely close to being mine. Now of course this could be chocked up to user error. But I'm not an idiot. I read all the instructions and walked through it numerous times. I used correct lighting. Cleaned the camera off. Took off my phone case so the camera could easily touch my skin. The first color match I got, before the app crapped out, seemed like it would be close to something I could wear. This color seems to almost be spot on to the color of my freckles. Which is odd, because I did my best to pick areas that were clear of freckles. So here we are. I have a foundation that I can't even pretend to use. Does it feel good on? No idea! Does it wear well? Maybe. Does it work with my skin type? Who knows! 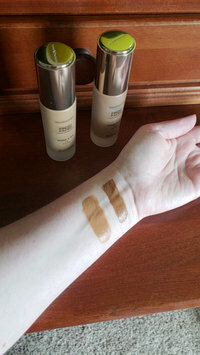 So now I have to get in touch with bare Minerals to see what to do, because I got this for free, but they do also have a color match guarantee.This is so ridiculous that I can't do anything but laugh. It happens. And hopefully it can be fixed. Especially on the app side, because the idea is very cool. Even if it was causing major issues for me. So for now I have to give it a lower rating. I hope I can come back and change that in the future. I contacted Bare Minerals to let them know about the issue and they were kind enough to give me a re-order code so I could do the process again. Their customer service was very nice and helpful and I appreciate the survey that they requested to better help this with the app, as hopefully they are taking feedback on issues to heart. After getting the second code I went off to re-scan my face. Again I followed all of the steps, all of the instructions, used the proper lighting. I ran through the process the 3 times they asked. I even had my husband watching over me to make sure I was holding my phone at the correct distance and hitting good, clear spots. Yet again, the color match felt off. Though it seemed better than what I had gotten last time. So off I went to use the replacement code. Now here's something that bothered me. The first time around it took a day or two after purchase for the product to show as ready for shipping. Which is totally fine and what I'd expect for a custom matched and made product. The second time through I got a shipping number within a few hours. For something that is supposed to be custom made, that felt like a rush and it didn't necessarily make me feel hopeful about how custom this actually is. When I got the replacement bottle I knew instantly, before even putting it on my skin that it wasn't right. It was still dark and nowhere close to my skin tone. Compared to the original bottle it was a lighter shade. So there's that I guess. But it's still not wearable. At this point I haven't contacted Bare Minerals again because I'm just over it. Clearly this app does not work for me. Plus I just got a new phone and they don't offer the app for it anyways. So it's not like I could re-do it a third time even if I wanted to. And here's the thing. I'm not an idiot. This is not user error, which is what this will be marked as. I can follow directions. I can do as I'm told. One time I might be be, but two times...no. I did everything correctly and got off shades twice. At this point, after racking my brain over what could be the cause, my best answer is my freckled pigmentation. That the phone must be picking up on that and not my actual skin tone. That's the best I, my husband, and friends could come up with. Overall this was disappointing. The idea is innovative and smart. It looks like it works for some women. But clearly there's some issues that need to be worked out. And I hope they will, because I like Bare Minerals and I like the idea of color matching at home. I actually don't use this shampoo because it's not great for color safe hair. So it's something I passed onto my husband, because he uses it! In fact he had just run out of it right when this came in, so it was perfect timing. My husband likes Head & Shoulders because it helps stop his dandruff issues. He says there's a night and day difference when using it. He particularly likes the Almond scent, because it's light and not overpowering. The price point is good too, especially for the larger bottles. My husband's hair also feels soft after using it. All and all I think it's a great shampoo that does what it says it will. I just wish it was color safe so I could personally use it (that's my one strike and why it didn't get 5 stars). I bought a bottle of No Drought from LUSH a few years back. Honestly, the size of their large bottle (4.6 oz) for the cost ($15.95) is what really sold me. I figured it would take forever to get through the bottle. I was right, just for the wrong reasons. I had used a powdered dry shampoo before, so I knew what I was getting into mess wise. Yet somehow the mess was even worse. The pop open nozzle either allows an overflow of product, or it gets clogged. I have yet to find an in between point. There's not really a graceful way of applying this. It's mess and makes puffs of powder as you rub it in. You end up with powder all over yourself and any clothing you are wearing. So it's not a dry shampoo I'd recommend to use if you are already dressed for the day. I could over look the mess if it worked well, but it just didn't for me. I never felt like it ever absorbed much of the oils in my hair. Instead it felt like I hadn't applied anything at all. Though clearly I did because of the noticeable white cast in my hair. I felt like I had to add way too much to my hair to get it to do anything of use. Even then it just made my scalp feel gross and my hair look slightly less greasy. I ended up putting No Drought away and started using something else, only to bring it back out for one more chance. After more of the same the bottle went off to live out its life elsewhere. I will say, for the price you pay you are getting a lot of product. It's impressive. It does have a nice, bright citrus type smell that is not overpowering at all. I really wish this had worked for me, but there's just other dry shampoos that work much much better for my hair! Naked Mighty Mango has become a staple in our household recently. Picked it up on a whim while in Costco while looking for things to use in smoothies. Quickly discovered that it is amazing. It has a thicker consistency, though not as thick as a smoothie. It is sweet, but it's easy to tell that the sweetness comes from the mangos, which I have always felt have a higher sweetness to them that most other fruits. The mango flavor on it is lovely and feels like you found the most perfectly pure mango of the bunch. While I love mixing it into my smoothies, I also just love to drink it as is. It's great for a sweet tooth, but doesn't leave me regretful. It's also great that the juice includes other fruits such as apples, oranges and bananas. All in all, I am so happy that I gave this drink a try! One of my favorite hand creams (I have a few). This is an OG for me. My mom used this hand cream and from there I started using it. Even when I get distracted with trying to work through other hand creams, I always find my way back to this one. I live in a very dry climate, so hand cream is a must for me. I have hand creams all over the house, my purse and car. Due to this I have tried a lot of hand creams and over the years have found a few that are truly amazing for me andy skin. Make A Difference Rejuvenating Hand Treatment is one of those hand creams. I love how hydrating this cream is. It feels slightly thick, but not heavy, and soaks in quickly. There is no greasy feeling left behind. Just soft, moisturized hands. I notice that the softness lasts for a good amount of time after application. It doesn't disappear right away, which is impressive to me. I also love the smell, it's fresh, almost spa like. It's not overpowering and leaves a nice scent behind a few minutes after application. It is on the pricier side, especially for a hand cream. Though I do find a bottle lasts for a nice amount of time, so that does help make the price hurt less. Personally I'll pay the higher price because it works so well for my hands. Worth a try if you're on the hunt for a nice hand cream. 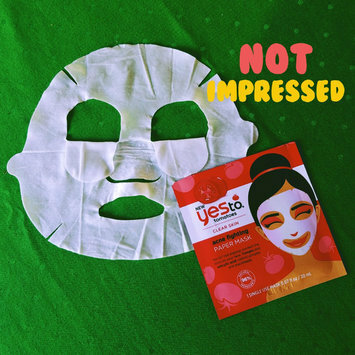 Im gonna have say a big no to Yes To Tomatoes Acne Fighting Paper Mask. Which is disappointing because I enjoy their makeup wipes and they put out consistently well reviewed products. The price tag, at $2.50, is the best thing about this mask quite honestly. I believe I grabbed these at Target when they were having some sort of 3-for deal. I picked them up because I have an ongoing battle with acne, so I'm always game to try out new acne fighting products. Especially in sheet mask form. Right off the bat, upon opening, I notice a strong alcohol smell with a fake tomato scent. Bummer. With there being alcohol in this and so far up in the ingredients list, there's a good chance that it's going to be drying. And it is. There are some really good ingredients in there though. With things like aloe juice, witch hazel, tomato extract, tea tree and pumpkin. Yet, even with all of those wonderful ingredients I still feel very meh about this mask. The essence is liquid-y and bubbles up when massaging it into the mask. For how liquid-y the essence feels, it doesn't drip or run too much which is nice. The mask material has a papery feeling and only feels slightly softer as it dries down. Then there's the fit...oh man. It's probably one of the worst fitting masks I've ever used and I have used a lot. It's a little too narrow for for my face and just barely reaches my chin and forehead properly. There are little tabs on either side, by the cheeks, that are there to help with application. While it seems like a smart idea, they weren't that helpful to me. The eye holes are cut very long with equally long flaps of the mask material that you have to fold down onto the mask. Really it's just a waist of material when you think about it. Especially because you are warned not to get the essence in your eyes. Shockingly the nose portion is WAY too long, and this is coming from someone who is constantly dealing with the nose portion of masks being to short. I have to scrunch it up to make it fit properly. There are notches cut into the mask to help with fit, but they are shallow and don't help much. Due to this, I have to bunch the sheet mask up along my chin and jawline. The mask does seem to dry out fast, but it is only recommended to wear for 10 minutes. So I can't be too disappointed at that. After removal of the mask I pat the essence into my face. I'm left with a stick feeling for about 5-10 minutes. It does dissipate mostly, with only a touch of stickiness once absorbed. I do notice my skin feels tighter, but not hydrated or moisturized in any way (that would be the alcohol). My skin and acne do look less red and there is a touch of softness to the skin. Overall though, I've seen much better results from similar products. At the end of the day this is not something I will repurchase. There's just too many misses with this to make me feel like it's worth it. Especially when there are similar products on the market that cost the same or less and have much better results. This is a really nice mask. I find it to be highly moisturizing for me and notice a nice plumpness and softness to my face after I use it. The essence soaks in quickly and doesn't feel sticky. There is a light fragrance to it. It's very fresh and not overpowering at all. Like others have mentioned there is a lot of essence left over in the package. This is due to the material and not wanting it to dry out. While some will apply it on to of the face mask (once applied), I know others will use it on their arms/chest/neck/etc. I personally save the essence in a jar and add a compressed face mask, giving me a second face mask with the essence. The mask itself is very thin, but surprisingly strong. For a one-size-fits-all kind of deal, the mask fits well on my face. Due to the thin material it is sandwiched between two sheets to help both with keeping it safe and with application. You remove one protective sheet, apply the gel side to your face and remove the other sheet. 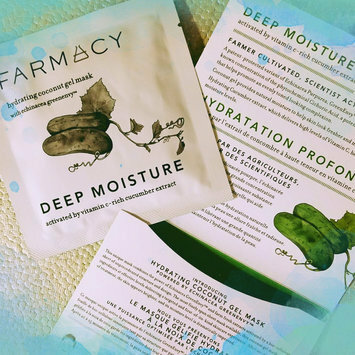 I will say if you're not big into sheet masks, there may be a learning curve for applying this. With the mask being a thin gel like material it doesn't want to come off of the second sheet easily and you may have to fight it a bit. Nothing too crazy, but it may be an issue for some. The masks come in packs of three, though I do know at some Sephora stores you can buy them individually. Compared to the multitude of other face masks on the market Farmacy masks are pricy. To the point that I would probably only buy and use these for special occasions. It's one of the reasons I can only give them four stars. Between the price and the ease of use, I know I probably won't purchase unless they are on a good deal. But other than those two things, I truly enjoy using these masks. They are absolutely lovely. I grabbed this when I found it on sale and because I am such a fan of Animal Crossing: New Leaf. This is a cute game where you get to build and decorate houses of various villagers based on their preferences. It's very easy to get into the get play. The design styles are very easy to follow, with all​ of the the furniture and decorations either already in your inventory or given to you for the specific house you're working on. You can also revisit villagers to add on additional rooms or redesign their current set up. The game does use the Amiibos and Amiibo cards. And while not necessary, it does add a fun component to the game. I'd say the biggest let down of the game is the villagers reactions to the room(s) you have decorated. I don't know if you can really upset them. They always seem happy, even if the room feels lack luster or doesn't fully convey what they wanted. The game can also feel a bit monotonous in that all you can really do is decorate. Yes you can visit your towns village and wonder the buildings you've helped build and decorate, but that's about it. I find that I play this game in very small bursts. Overall though, it's an enjoyable game that is relaxing and easy to play.